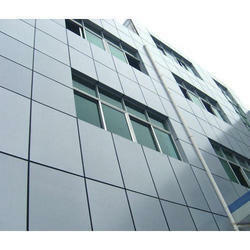 Being a customer oriented organization, we are deeply engaged in offering a wide array of Aluminium Composite Panel. A curtain wall is made of aluminum coated. A curtain wall is made of aluminum coated (2.00 mm thick) in the shape of "U" anchored to the wall by means of suitable brackets made of aluminum or stainless steel of suitable thickness. Aluminum Composite Panel (ACP) is a kind of new decoration material, which comes to attract great attention within a short time, due to its excellent performance, such as low cost, many available colors, convenient installation, good processing feature and outstanding fireproof characteristic.